SOCHI, RUSSIA - Her gold medal-clinching rock wasn’t even halfway to the house when Canada skip Jennifer Jones put her hands to her face, soaked in the moment, then jumped up with her broom hoisted in the air. Jones didn’t need to see the end result. After a 16-year wait, Canada’s women were Olympic curling champions. Canada denied Sweden a third straight Olympic title with a tension-filled 6-3 victory at the Sochi Games on Thursday, completing an unbeaten campaign of 11 wins — an unprecedented achievement in the women’s game. The gold medal fills the resume of Jones, who already has won world and multiple Canadian titles. It must rank her among the best female curlers in the sport’s history. The Canadians broke up a scrappy, error-strewn final by stealing two points in the ninth end when Maria Prytz, throwing Sweden’s final rock, was short with a draw and bumped another of her rocks away from the button. Instead of potentially being down 5-4 with one end to play, Canada was up 6-3. The last end was a formality, with the Canadians playing takeout after takeout. A smile appeared on Jones’ face as it became apparent there was no way back for the Swedes. And fittingly, the tournament’s best player took the last throw — having spent what seemed like an age scrubbing the base of the rock, just to make sure. Anette Norberg was Sweden’s skip for the last two Olympic successes, the second coming in Vancouver four years ago when Canada’s Cheryl Bernard had a meltdown in the final two ends to give the Swedes a 7-6 win. The Swedes put up a good fight in their title defense before a three-quarter-full Ice Cube Curling Center. And it could have been so different had Prytz not missed a great chance for four points — and a 5-3 lead — in the fifth end. She failed to make a clean double takeout and was fortunate in the end to claim two points to tie the score at 3-3. After Jones’ last rock bumped a Swedish stone out of the house to seal the win, she bounded down the ice and, with a joyous whoop, huddled with her teammates and jumped up and down. 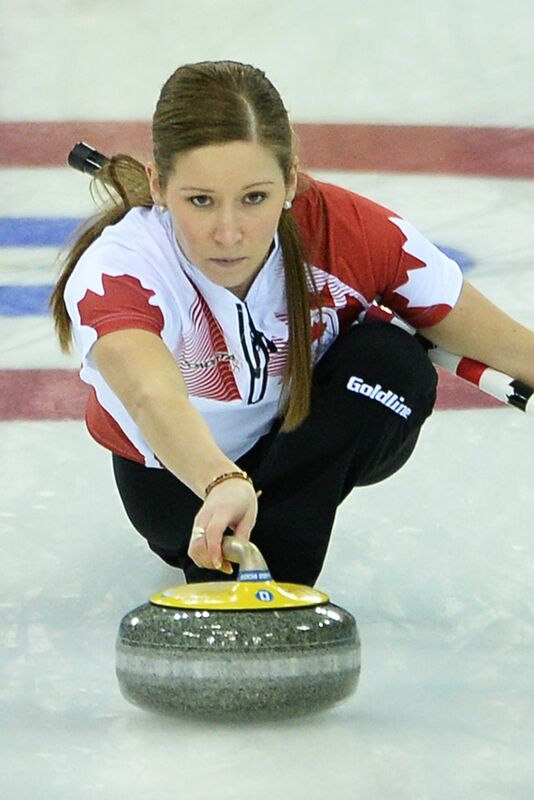 Kaitlyn Lawes, Canada’s weakest link on the day with 68 percent accuracy, glanced at her mother in the stands and thought about her late father Keith, who passed away in 2008. The championship means Canada’s women curlers have finally stepped out of the shadow of their men’s teams, who have won gold at the last two Olympics and will go for another on Friday against Britain. As for Jones, who just 18 months ago was sidelined after knee surgery and pregnant with her first baby, the debate has just started as to where she lies in the pantheon of great female curlers. Only Canada’s Kevin Martin has led a team undefeated through an Olympic campaign, in 2010. Does this make Jones the greatest? Britain beat Switzerland 6-5 earlier Thursday to win the bronze medal.